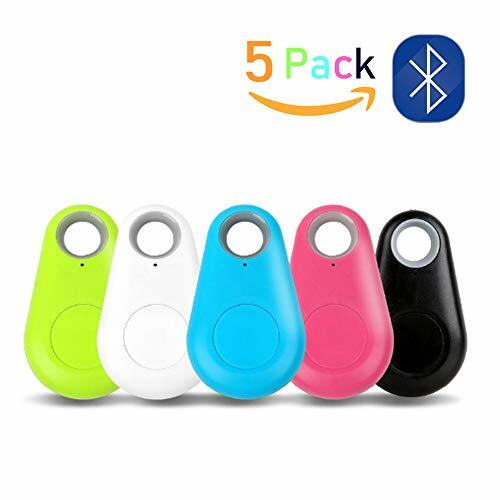 5 Pack Smart Bluetooth Anti-Lost Locator Tracker Alarm Finder with Voice Recording Self-Portrait Button for Wallet Kids Pet Baggage Bag Phone by PalmTalkHome at iShare Maps. Hurry! Limited time offer. Offer valid only while supplies last. Feature: ✅This anti-lost device adopts latest bluetooth 4.0 low consumption technology, and through corresponding app to realize all the functions. ✅This anti-lost device adopts latest bluetooth 4.0 low consumption technology, and through corresponding app to realize all the functions. ✅Benefiting from the built-in low consumption bluetooth 4.0, the battery can last for about 1 year. What's more you can preset 8 devices in one phone at the same time. Multifunction:The Anti-lost alarm has remote control function and protect your valuables,kids,pets from theft or loss.It can also provide a last seen pin-drop on map via APP to help you recover your items and search your cars in parking site. High Precision Quality :High quality plastic makes the key finder more sturdy and exquisite. Mini size with fashion design will be a perfect decoration. It is portable and convenient. Easy to carry and use with a lovely string, Super convenient and helpful in your daily life! Wide Compatibility:The tracker works with both Android system and iOS system. Apple iOS system needs to be iOS 8 system or above. Android devices which support Bluetooth 4.0 or above system version will work. Specific device models please refer to the description to get more details. If you have any questions about this product by PalmTalkHome, contact us by completing and submitting the form below. If you are looking for a specif part number, please include it with your message.